Praeconium exhibitionis gentium (Theodisce Völkerschau) Stutgartiae Germaniae anno 1928. 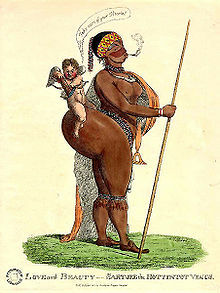 Sara Baartman, Venus Hottentotana appellata. Nata in familia Khoisana, Londinii saeculo undevicensimo ineute exhibebatur. 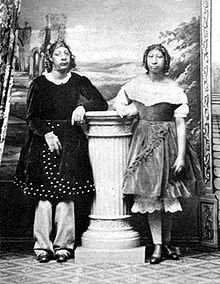 Maximus et Bartola, puer et puella microcephalici circa 1867 exhibebantur. Expositio ethnologica, etiam hortus zoologicus humanus appellata, fuit publica hominum exhibitio plerumque saeculis undevicensimo, vicensimo, et vicensimo uno habita, usitate personarum in statu naturali vel primitivo putato. Ostentationes saepe variationes culturales iactaverunt inter Europaeos mundi Occidentalis gentesque non Europaeas (vel alios Europaeos) quorum modus vivendi primitivus habebatur. Nonnullae Africanos indigenas in continuo inter Hominidas inferiores et homines albos collocaverunt. Spectatores recentiores expositiones ethnologicas ut exempla rassismi reprehenderunt. ↑ Pascal Blanchard, Sandrine Lemaire, et Nicolas Bancel, Human zoos: Racist theme parks for Europe's colonialists. (Le Monde Diplomatique, 2000). Bancel, Nicolas, Pascal Blanchard, Gilles Boëtsch, Eric Deroo, et Sandrine Lemaire. 2002. Zoos humains: De la Vénus hottentote aux reality shows. Edition La Découverte. ISBN 2-7071-4401-0. Dreesbach, Anne. 2012. Colonial Exhibitions, 'Völkerschauen' and the Display of the 'Other'. European History Online. Moguntiaci: Institute of European History. Fusco, Coco, et Paula Eredia, dirs. 1997. The Couple in the Cage. Pellicula. Geppert, Alexander C. T. 2010. Fleeting Cities: Imperial Expositions in Fin-de-Siècle Europe. Basingstoke: Palgrave Macmillan. Hager, Barbara, dir. 2007. From Bella Coola to Berlin. Pellicula. Broadcaster—Bravo! Canada. Hager, Barbara, dir. 2007. Indianer in Berlin: Hagenbeck's Volkerschau. Pellicula. Broadcaster—Discovery Germany Geschichte Channel. Qureshi, Sadiah. 2004. Displaying Sara Baartman, the 'Hottentot Venus'. History of Science 42:233-257. PDF. Qureshi, Sadiah. 2011. Peoples on Parade: Exhibitions, Empire and Anthropology in Nineteenth-Century Britain. Warnier, Régis. 2005. Man to Man. Pellicula. Vicimedia Communia plura habent quae ad hortos zoologicos humanos spectant. Blanchard, Pascal, Sandrine Lemaire, et Nicolas Bancel. 2000. Human zoos: Racist theme parks for Europe's colonialists. Le Monde Diplomatique. Jonassohn, Kurt. 2000. On a Neglected Aspect Of Western Racism. Situs proprius. Adelaide Human Zoo. Vann, Michael. The Colonial Exposition of May 1931. Novissima mutatio die 30 Septembris 2016 hora 20:00 facta.